dailydelicious: Ham and Spring Onion Muffin: For your lazy Sunday brunch! 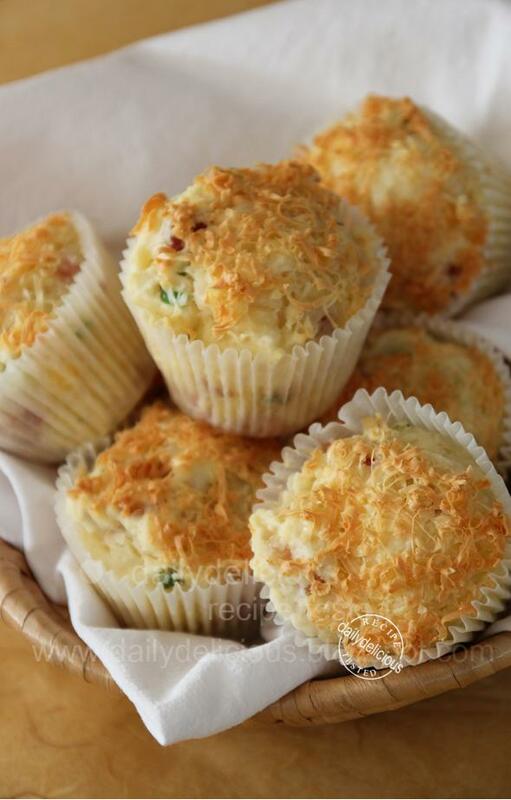 Ham and Spring Onion Muffin: For your lazy Sunday brunch! 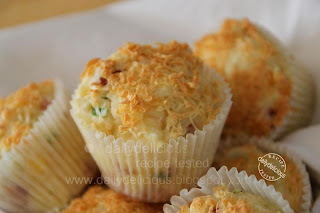 For your lazy Sunday brunch, may I suggest "Ham and Spring Onion Muffin". 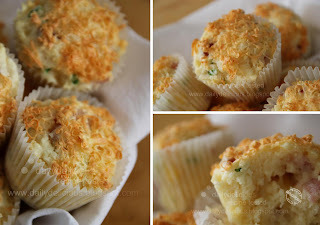 Actually, I love muffin, it's very easy to make and a warm muffin will warm your heart too. Making the muffin is so easy, you can prepare everything in advance and put them in the fridge and mix them together when you wake up, and it takes only 18-20 minutes to bake!. So, it's one of the quickest homemade breakfast. I got this recipe from the ............. magazine (UK edition, issue: August 2010, the same one that I use the frosting recipe for flower carrot cake). And at that time I had my eyes on this muffin too, but well, I'm still on my vacation and I didn't have to make my own breakfast, haha. So, right now, when I have to bake well, I choose to make this one, ^^. For anyone who afraid of the word over-mix (or anything that most of the cookbook warm you), the only thing that you have to pay attention is just fold until your wet and dry batter look almost combine, a few spot of flour is Ok.
That the key for making soft muffin, you don't have to stir until all of them turn into sticky batter, because if that happens, your muffin will be tough. So, for this weekend you don't have to wake up early, and you still have a delicious muffin for breakfast, it's great right? Line 7 muffin tins with paper case. Sift the flour, baking powder, sugar, and salt into a large bowl. 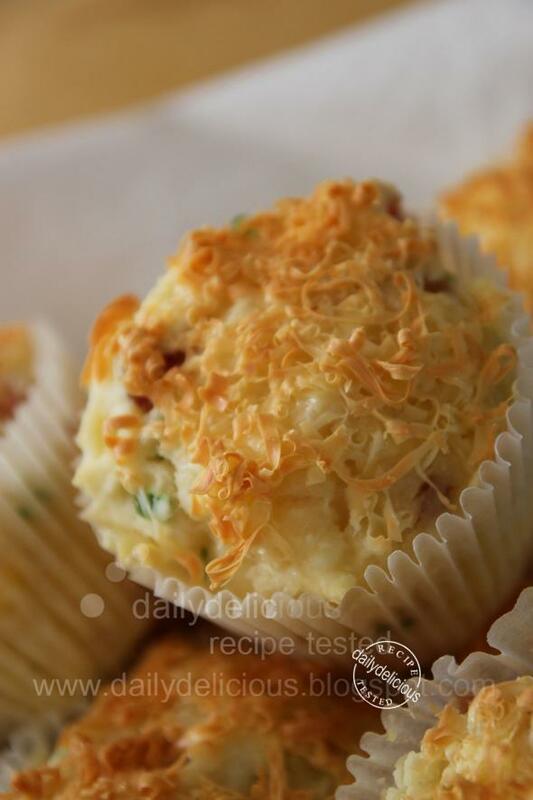 Whisk together the oil, egg, sour cream, and milk, then fold into the flour. Fold in the ham, Cheddar and spring onion. Don’t over-mix. Divide the mixture evenly among the muffin cases. Sprinkle over the extra grated Cheddar, then bake for 18-20 minutes until risen, golden and springy to touch. Allow to cool before serving. For your lazy Sunday brunch! Nice muffins! 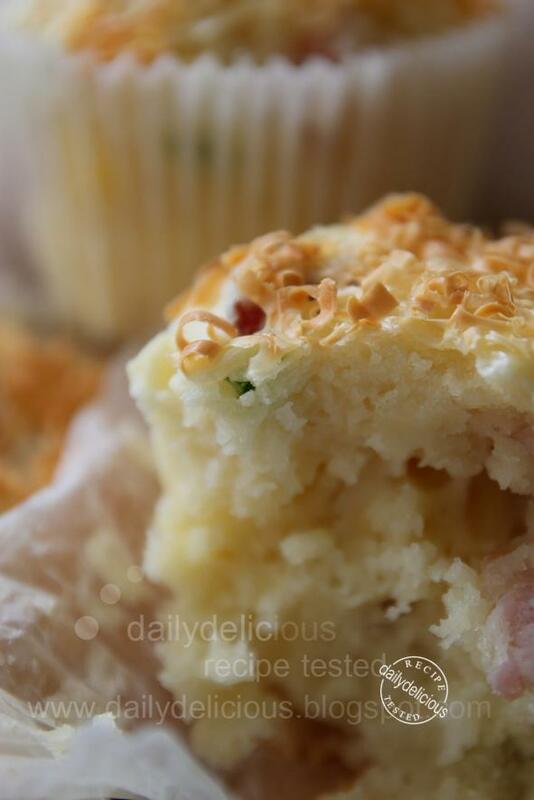 I like making muffin also, it's simple and delicious, thanks for sharing the recipe, want to try one day. Those look fantastic! I can imagine eating one of those for breakfast, or just for snacking when I am hungry ;). looks nice, good for breakfast! Hi, i always read when making muffin/cupcake don't over mix. but in what condition is consider overmix? because i try to bake the white chocolate muffin as per your recipe, i found that the muffin looked a bit wet inside after baking. izit due to the white chocolate melting or because i've overmix it? Hope you like it, after trying it, ^^. Actually, I can eat it anytime too, esp, in the late afternoon ^^. About the white chocolate muffin, does it still wet when cool? But I think it's not about the over mix, because over mix will make the muffin tough not wet. Yes, you can use yogurt, but if you use a whipping cream, add 1/2 tsp of lemon juice into the whipping cream first. The texture should be fluffy, you can see from my photo. It could be a problem from the mixing process, the quick and light hand is need ^^. Hi thanks for sharing! I tried making it recently and love it. Well, thank you for coming to make a confirmation about these recipe, I do love it too.